In the eighties one of the most widely spread and known games was Boulderdash (along with some other big 8-bit hits). This game had great playability but from the technical aspect it was rather poor. The times of 8-bit computers are with no doubt behind us, but that doesn't mean that those games are forgotten. There are several quality ports available for today's computers. I have designed several levels for one of them, Emerald Mines for Amiga. You can download these from my site. To play them on Windows or other OS you need an emulator. 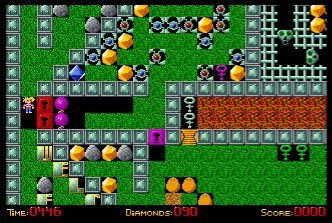 Forgotten Mine 1 (ForgottenMine1.zip (302.1 KB)) is a complete Emerald Mine V6 disk with 81 levels playable only in single player mode. You don't need any additional files, both AGA and ECS versions of the game are included in the archive. Forgotten Mine 2 (ForgottenMine2.zip (12.21 KB)) archive contains 23 levels for Emerald Mine V6. No Emerald Mine executable is included, so you need to get it from elsewhere (from Forgotten Mine 1 archive for example). This should be a preview of Forgotten Mine 2 which will probably never get finished.